Sorry, nothing to report on The Phantom Claw. Mike was crunched with Lobster Johnson stories and Darkness Calls scripts and then a production emergency on BALTIMORE, all projects that I'm anxious to see. But after I rewrite the script and distribute it I'm sure it'll just mean more waiting for a decision so Mike isn't holding anything up. I went back into the script and decided to replace generic cannon fodder with characters with names. It means nothing to the story and you'll never hear them referred to by names but it helps in the casting, recording and design phase if specific characters are called out. That way be don't have men voicing women and the like. To keep it straight in my head, I did quick doodles of a number of character types to help me track who was in what scene and when they should die. I put them all in white lab coats with a variety of dress underneath. The group from the 1944 flashback is more eccentric. But these won't necessarily be the final character types. We'll definitely put more variety into their heights, for instance. 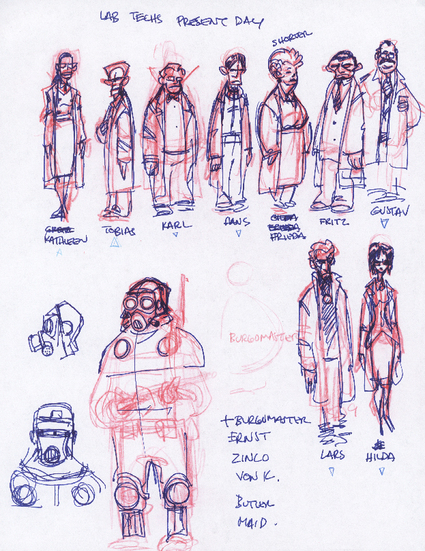 There's also a sketch of a Zinco employee in goggles and gas mask. But I don't like this design. Just playing around with shapes and ideas, playing with a pencil. cool stuff Tad!! !remind me why i didn't ask you for a sketch when i saw you at Dark Delicacies?Darn!! !Yet another missed opportunity.Seriously,looks like fun fleshing out characters. Love your version of lil' HB, Tad! I also like your other characters sketches. Just reminds me how much I miss seeing your artwork. There's definitely some McQuarrie action going on in that Zinco fella. Very cool stuff! I thought about the McQuarrie feel too, but in a negative sense. Mike always has a sort of retro feel to his stuff. But those are just doodles, nothing serious. a Tobias. But no Otto? Huh. tad, i met a guy named bill recently who apparently knows you... he lives in japan now and was one of the guys who helped bring Dark Horse to life... anyway...i now work for him here in tokyo... but unfortunately i have to move back the to usa because of financial and some legal reasons... argh. 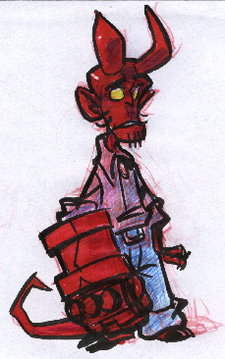 anyway, i hope that this second animated hellboy project goes well. i'll be a special guest at the next comic con, maybe i'll catch ya there. diggin the designs on Frieda and Gustav..I'm curious as well...Alot of your sektches so far seem mignola esque in design. Is this how you worked when doing the cartoon? Start everything with a mignola style then break down into the cartoony style that is Hellboy Animated? Otto is in the 1944 group. Jeremy, the comic looks cool. Hope to see you in San Diego. hb, we let the monsters be more Mignola because Cheeks' art seems naturally friendly. I don't see a lot of Mike in my sketches other than the blank glasses, sloping shoulders and the simplicity of the doodles. These were for my benefit as screenwriter but will be passed onto the artists. Usually we pointed to Mignola art as a basis for all our designs even though they were to be drastically reinterpreted. And the woman next to him was almost Sparky. I felt obliged to keep the Eurocentric thing going. Fun to draw. With all the management stuff you have to do to bring ideas to animated life, it's cool that you still so enjoy drawing a character. Amen, play Woman. I think that is a special quality that Tad brings to the projects he works on.